Sent 20 May 2010 from Khumjung, our 31st Wedding Anniversary! 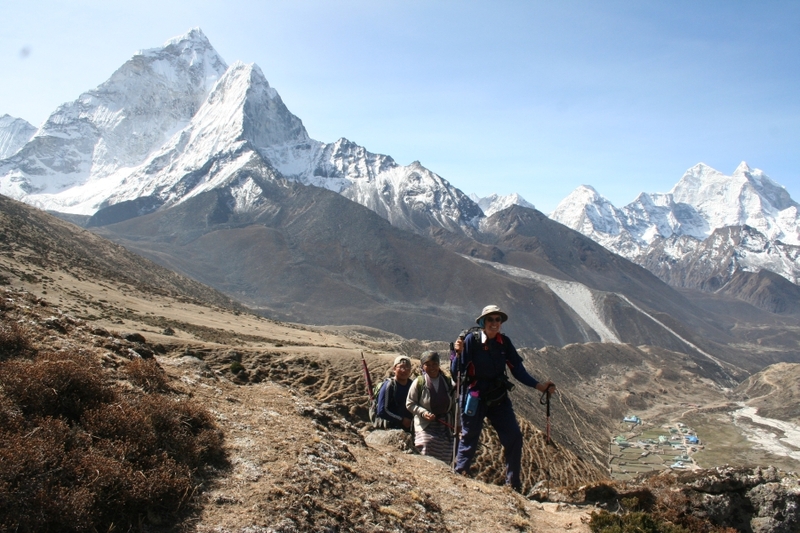 The map below shows our month-long trek through the Everest (Khumbu) region NE of Kathmandu. This particular newsletter covers our 4 day trek up the right hand side of the circle. Mt. Everest is the pin in the top right. We've been out of both electricity and internet access for the last couple of weeks - sorry for the delay. We've just completed an amazing circuit, going up to Everest Base Camp, then across Cho La (La meaning Pass) to Gokyo, then across Renjo La to the Thame valley, and finally back to our host Pema's house in Khumjung. 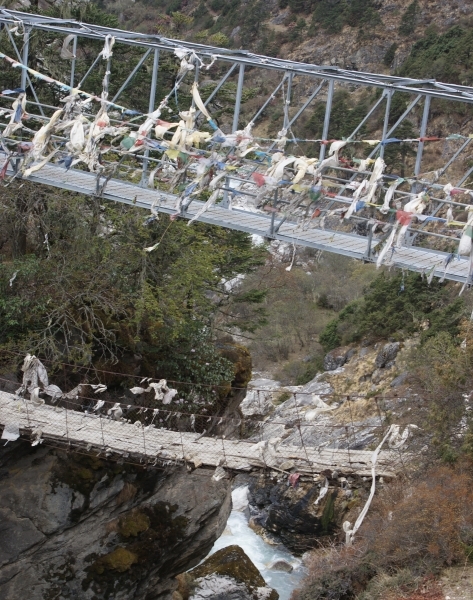 This newsletter covers the first half of that trip, up to Mt Everest's doorstep. 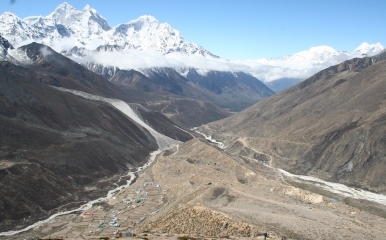 As you can see from the map above, the network of valleys in the Khumbu area are shaped a bit like a capital E on its back (ш), with the arms pointing NNW. Namche Bazaar (the main Sherpa village) and Khumjung (Pema's home) are at the southern corner (at the bottom of the circle on the map). 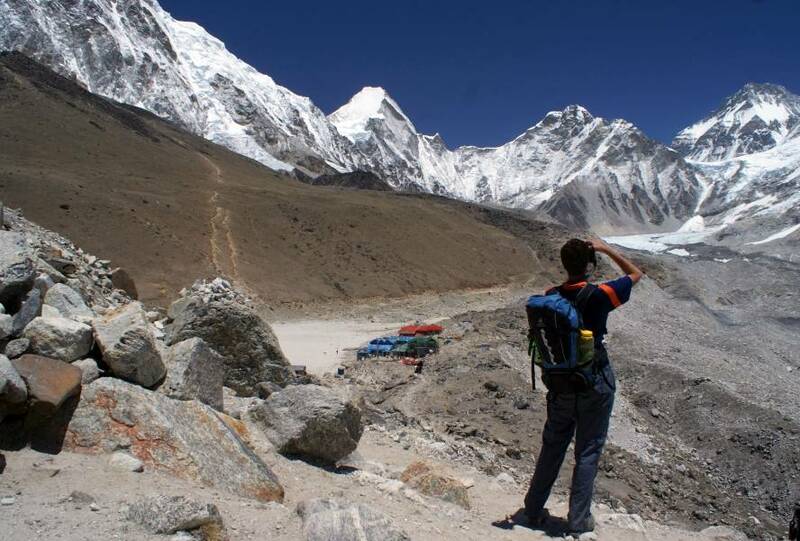 The furthest NE arm goes up to Everest Base Camp. The middle arm goes up to the village of Gokyo, and the SW arm goes up to Thame, where the Mani Rimdu festival will be held in a few days. Most trekkers go up the valleys and then back down them, but we decided to take the 2 high passes that connect the ends of the arms of the E, so we could make a circle without repeating our track very much. 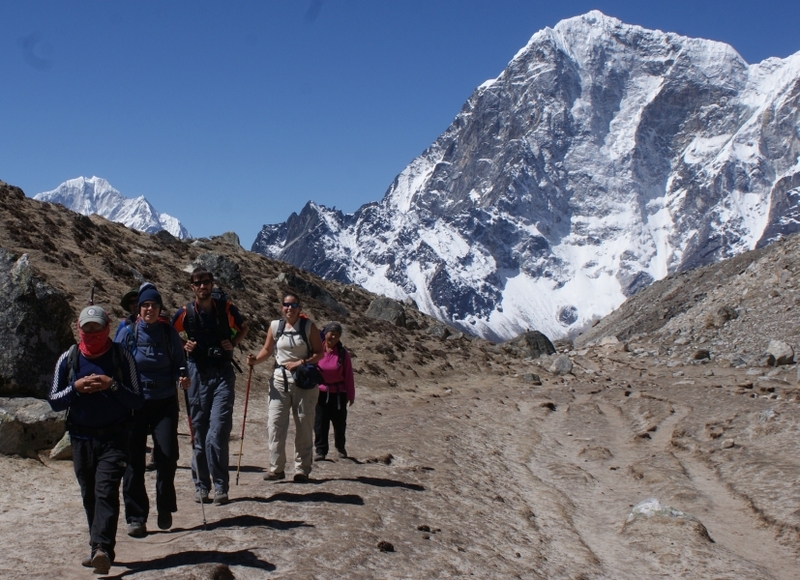 This means that we did not trek the middle (Gokyo) valley, as we came to Gokyo and left via passes from neighboring valleys. Thangboche is on the back of the E, about where the middle (Gokyo) arm meets the back but on the SE side of the Dudh Kosi river. Our hike started out traversing across a steep slope through fields of white, pink, and yellow blooming rhododendrons. Some of these are full-on trees, 65' (20m) high. Some of the glens looked so perfect, as if some wizened gardener with infinite patience had carefully placed each rock and bush to create a perfect garden. 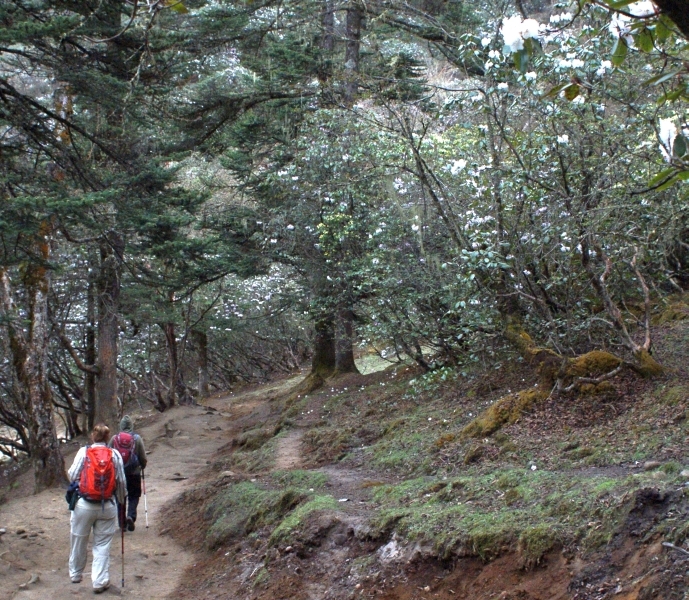 Our trail trended gently down while the Dudh Kosi river below rose up to meet us. When we crossed over to the south-facing bank our scenery changed dramatically to low shrubs and more open vistas, while the trail started grinding up the valley towards Dingboche, 2,600' (800m) above us. Dingboche is actually just off the Everest Highway, somewhat past where the E turns to go up to Base Camp, but it's warmer because it doesn't get the fierce winds that can blow up the valley. Still, after we crossed the river going up to Base Camp, the clouds came in and the wind came up, chilling us and limiting our visibility. At this altitude (14,000' or 4250m) we're well above the tree line, so only small shrubs like juniper or dwarf rhododendron can survive. We got the impression we were hiking across a barren, rolling moonscape, so we were glad to get to our guesthouse. A friend of Pema's owns this guesthouse so we were treated very well. It's crazy - we're higher than ANY mountain in the lower 48 states of the USA (Denali, in Alaska, is over 22,000' high), and we're in a VALLEY! Long-haired Yaks (and people) are wandering around between rock-lined fields of potatoes and barley, while clouds play with mountain tops that are still impossibly high above us. Our guesthouse is built mostly of dry-set stone with thin plywood covering the insides. Our room has a stunning view down the valley we've hiked up as well as some of the village. Porters on the "Everest Highway"
The dining room (on the 2nd floor) is a big airy window-enclosed room with comfortably padded bench seats and back-rests around the outside (all covered in Tibetan wool carpets), tables and chairs just inside of those, surrounding a pot-bellied stove in the middle. We're well above tree-line so most of the stove's fuel is dried yak-dung, but it's quite warm and surprisingly odorless (we're happy the cooking is done over kerosene burners). Several other trekkers from all over the world, as well as several Sherpas, are sitting around chatting and joking with each other. Next to me is a Buddhist monk in saffron robes, rocking back and forth and chanting prayers that he's reading from wide but short thick book that he wraps in silk brocade when he's not using it. The afternoon clouds have come in so it's nice to be in this cozy space, but the high mountain peaks poke through now and then. As we trek above about 10,000' (3,000m) we're advised to sleep no more than 1,000' (300m) higher than the night before. If we go up too quickly then we risk altitude sickness, and Jon and Chris have already started showing some symptoms (mostly poor sleep). Since we actually went up twice that much on yesterday's hike, we decided to take an acclimatization day and just take a day-climb up the hill behind us. The adage is to walk high and sleep low. The day dawned bright and beautiful without a cloud in the sky so we were up by 6 and walking shortly after 7. The clouds started closing in after only an hour or so but we wanted to make some altitude so we plugged on regardless. Our perseverance was rewarded when the skies miraculously cleared and we found ourselves under clear blue skies and surrounded by majestic peaks. Our hill was above a river intersection, so we could look along 3 valleys. The mountains were absolutely stunning - Ama Dablam was almost over us, Kangtega and Tamserku were down the valley a bit with Kongde beyond them. Island Peak, Lhotse Shar and Makalu (5th highest in the world) were further up the Dingboche valley, while Taboche, Cholatse, and a handful of smaller peaks could be seen up the west side of the Everest (Khumbu) valley. The day again dawned bright and beautiful, without a cloud in the sky. We left Dingboche and climbed up the same trail as yesterday to the chortens and prayer flags above town. Here we said goodbye to Island Peak, Makalu and the other mountains up the Dingboche valley as we walked up towards Everest Base Camp. The trail traversed up a wide yak-pasture with a drop-off on the left (west) side that looked down on the main Everest highway in the valley below. It was fun watching the people and yak‑trains over 1,000' (300m) below us. Then we got to the end of the moraine for the Khumbu Glacier that falls off Everest. We crossed the Dudh Kosi river (for possibly the last time) over an emergency bridge because the old bridge had been washed out a year ago. We fortified ourselves with tea and hot lemon at a tea-house before grinding 700' (200m) up the terminal moraine to a series of perhaps 30 chortens that have been erected to honor some of the climbers who have died on Everest. 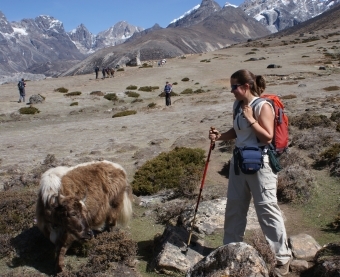 We then walked a rocky trail along the side of the lateral moraine to get to the tiny village of Lobuche. 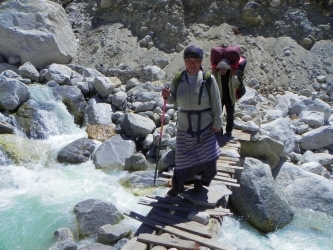 The walk from Lobuche to Gorak Shep (which means Dead Raven) is only a few miles but there aren't many guesthouses at Gorak Shep and Lobuche was pretty full, so we sent one of our porters on ahead to reserve rooms for us. The trail itself was fairly gentle, first climbing next to the lateral moraine and then climbing up to the top of the moraine, allowing us to see down onto the Khumbu Glacier. This far from its source the glacier is mostly covered with rocks, but there are several pools of water, often of varying colors. Presumably the clear pools are just static pools of melt-water while the murky pools are full of rock‑flour sediment and are actually part of the stream that will later become the Dudh Kosi. In 1980 Gorak Shep was nothing more than a wide spot on the trail, a flat sandy area at the base of Kala Pattar (which offers the classic glorious view of Everest). Now there are 4‑5 guesthouses, a special lodge for porters, and a helicopter landing pad! We arrived in time for lunch but the afternoon clouded over with snow flurries in the air. We're going to cut this off here at Everest's doorstep and continue with the rest of our Khumbu adventures in our High Passes newsletter.